About "Sector of a circle"
A part of the interior of a circle enclosed by an arc and two radii is called a sector of a given circle. Consider a sector of a circle whose central angle measure. 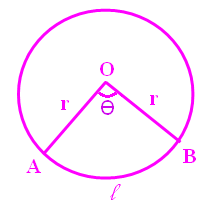 ∠AOB = θ and radius "r" and length of arc AB is known as L.
A larger part occupied by two radii is called the major sector. A major sector has central angle which is more than 180°. 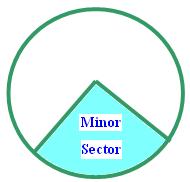 A smaller part occupied by two radii is called the minor sector. A minor sector has central angle which is less than 180°. 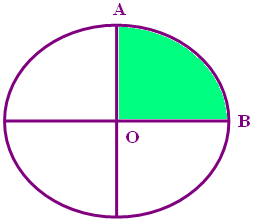 A part occupied by two radii with central angle 90° is called quadrant. In other words we can define quadrant as one fourth of the circle. 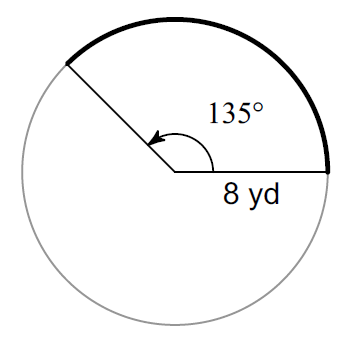 A part occupied by two radii with central angle 180° is called the semicircle. 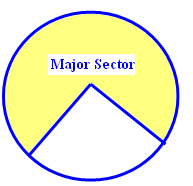 Now we are going to have a set of question in which you have to choose which is major sector and which is minor sector. Hence, the area of the sector is about 923.2 cm². Hence, the length of the arc is about 18.9 yd. Find the perimeter of sector whose area is 324 square cm and the radius is 27 cm. To find perimeter of sector, we need length of arc and radius of sector. In the given question, we have radius but we don't have arc length. In order to find the arc length, let us use the formula (1/2) L r instead of area of sector. Now we may find the perimeter. After having gone through the stuff given above, we hope that the students would have understood "Sector of a circle".